Lisa Nakamura and Peter A. Chow-White, eds. Race After the Internet. Routledge, 2012. 343 pp. In their introduction to the edited collected Race After the Internet, Lisa Nakamura and Peter A. Chow-White trace the emergence of multiple digital divides in the wake of what they call at different moments the “biotechnical turn,” the “technobiological turn,” and the “techno-genetic turn”–a cultural, institutional, and scholarly transformation that “privileges the technological and specifically the digital over other forms of knowledge, mediation, and interaction”(4). They open the collection by declaring the importance of an expansion of critical race scholarship that addresses the conceptual and experiential imbrication of race and the digital. Turning to the African American Lives series produced for PBS by Henry Louis Gates as a paradigmatic example, Nakamura and Chow-White argue that Gates’ investment in digitally distributed genealogical inquiries about racial identity highlights the ways in which “race has itself become a digital medium, a distinctive set of informatic codes, networked mediated narratives, maps, images and visualizations that index identity”(5). The recognition of a “digital divide” isn’t new to critical race theory or to broader discussions of technology, but this collection advances these conversations by combining fresh investigations of unequal access to technology along and across racial lines with an exploration of the “co-production of race and computing”(6). This approach frames the collected essays within a dynamic critical matrix in which various constituencies are defined not only through their access to and representation within digital media but also through their tactical engagements with digital media. The collection thus manages to resist the utopian theorization of digital media as racially neutral without limiting its analysis to the representational biases and limits on display on digital screens. Citing Tara McPherson’s opening essay on the relationship between discourses of race and the development of the UNIX operating system and her observation of a shared modularity between UNIX and racial logics as a critical model, Nakamura and Chow-White propose that “media critics must force themselves to do more than read what’s visible in new media’s interfaces, for this work may distract us from the working of race within code itself”(8-9). With this provocation, the editors tie their advocacy of critical race scholarship that recognizes the shifting definitions of race in a digital context to the separation of the digital from the visual. Wendy Chun’s “Race and/as Technology or How to Do Things With Race” investigates the ways in which race can be analyzed not only as a digital representation but also as a technique. She finds in a close reading of Greg Pak’s film Robot Stories a template for the rethinking of high-tech Orientalism or the figuration of the “raced other as technology”(49) because the film “plays[s] with the stereotypes of Asian Americans as relentless, robotic workers, as looking all the same (can’t tell them apart), as dragon ladies, in order to create a livable future – literally a future in which Asian Americans and African Americans live as the non-abject”(52). By approaching race as technology, the film challenges the link between visuality and representation, “making possible new modes of agency and causality”(56). The effort to “rethink the rhetoric of the digital divide”(11) also entails a rigorous examination of new forms of racial coding, particularly within new media. In his essay “Does the Whatever Speak?,” Alexander R. Galloway begins with a photograph of the rehearsal for the inauguration of President Barack Obama depicting the stand-ins for the President and his wife–a black man and a black woman. Galloway observes the bizarre specificity of this moment of racial typing: “The very lack of necessity drills forward like an irresistible force. Racial coding has not gone away in recent years, it has only migrated into the realm of the dress rehearsal, the realm of pure simulation, and as simulation it remains absolutely necessary. The Obama body doubles, as pure simulation, must be black”(113). This reflection on the reliance of the virtual on the absolute buttresses Galloway’s observation that the popular massively multiplayer role playing game World of Warcraft operates through a split logic in which “race is static and universal, while class is variable and learned”(118). His examination of racialized avatars and their rigid coding leads to a call to embrace “the whatever” as a critical and political intervention. The reimagining of the rhetorics of the digital divide turns to social networking in two directly linked essays contributed by danah boyd and Eszter Hargittai. boyd mines interviews with Massachusetts teenagers about their social networking experiences to investigate digital segregation among social media platforms. The academic year 2006-2007 witnessed a radical shift from MySpace to Facebook as the preferred social networking site among white teenagers. One of the users boyd interviews describes MySpace as a “ghetto,” adding rhetorical resonance to boyd’s observation of the racial division that emerged during this time between MySpace and Facebook. boyd cautiously uses the term “digital white flight” to describe this migration, registering her reluctance to “devalue the historical tragedy that white racism brought to many cities” but noting the importance of issuing “a stark framework for seeing the reproduction of social divisions in a society still shaped by racism”(218). Hargittai’s quantitative analysis of the racially segregated use of a set of social networking sites complements boyd’s ethnographic analysis. Collecting data from two cohorts of students at the University of Illinois, Chicago during the same academic year, Hargittai finds race and ethnicity to be significant variables in the usage of specific social networking sites like MySpace and Facebook. She concludes that online social networking in many ways replicates offline social networking, constraining the imagined possibilities of cross-cultural interaction in online fora. These paired studies support the collection’s overall investment in moving beyond the formulation of the digital divide solely in terms of unequal resources (although issues of access remain relevant and urgent) in order to acknowledge the multiple divides that structure digital experiences. The final set of essays in the collection returns to the focus on the “biotechnical turn” introduced by the editors. Developments in racial genomics intersect with the expansion of digital media to produce important iterations of the “race as technology” model introduced by Chun. Alonda Nelson and Jeong Won Hwang explore one of these points of intersection in their discussion of the proliferation of genealogical revelation videos on YouTube. Young amateur genealogists use genetic ancestry tests provided by biotechnology companies to explore their genetic and racial histories, record their discoveries on video (including the moment of the “reveal” in which they open the results of their genetic tests for the first time on camera), and then post their revelation videos on YouTube, inviting viewers to comment on what are often surprising results that challenge the link between racial identity and genetic identity. Nelson and Hwang describe these videos as “roots revelations” and argue that the videos allow the young genealogists to “perform the new or elaborated selves made available to them through genetic ancestry testing”(272), transforming these revelations into digitally-mediated social encounters. 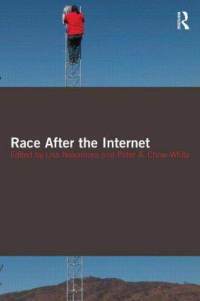 Race After the Internet provides a new set of frameworks for analyzing race and technology, continuing established conversations about the digital divide while drawing attention to the emergence of multiple digital divides. One of the main strengths of the collection is its interdisciplinarity, showcasing new scholarship from the fields of media studies, literary studies, communication, information studies, and sociology. The volume manages to maintain critical coherence while bringing together discussions of gaming, genomics, online journalism, social networking, labor relations, and data mining (to name only a small selection of the book’s subjects). In a field in which new technological and cultural developments often limit the endurance of scholarly attempts to make sense of those developments, this collection promises to have staying power for scholars interested in developing critical race studies in tandem with developments in technology. Lisa Patti is Visiting Assistant Professor in the Media and Society Program at Hobart and William Smith Colleges. Her current research focuses on the contemporary translation and distribution of multilingual media.